The MotorVac® coolant exchanger has been updated to meet the needs of today's busy service centres. The CoolantClean™ III now includes our D-Gas adapter service kit and a coolant ow directional adapter. These new additions help to reduce service times and simplify service connections for the technician. A complete, thorough and profitable coolant exchange is now easier then ever. Why Use the Motorvac CoolantClean System? CoolantClean is designed to exchange virtually all of the used coolant mixture in a vehicle?s cooling system, and do it in only a few simple steps! The CoolantClean coolant flush service can increase a shop?s profits by reducing the time it takes to do a complete fluid exchange to approximately 15 minutes. This new turn-key radiator service system is easy to use and compatible with most automotive vehicles. CoolantClean's advanced flush system allows complete control. CoolantClean connects through the upper radiator hose and provides a clean, "environmentally friendly" and systematic approach to servicing cooling systems. The unit will flush virtually all of the old coolant and replace it with the new coolant mixture in just a few easy steps! Normally, when a technician drains coolant from a vehicle, the process is time consuming, incomplete, messy and dangerous. The CoolantClean system changes all that. With CoolantClean, the process is quick, easy and safe. CoolantClean completes the fluid exchange faster and completely, even replacing the old coolant from the engine block and heater core. CoolantClean also has a unique vacuum system, which allows for radiator depressurization and reservoir fluid evacuation. 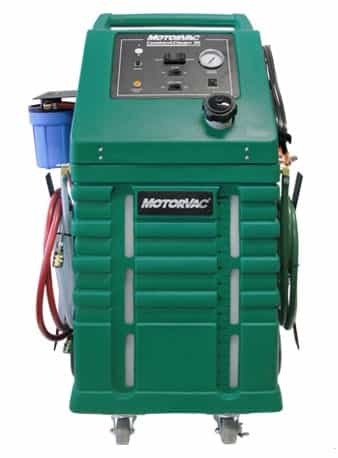 MotorVac provides two solutions that when used will further enhance the CoolantClean service. A specially formulated radiator flush restores cooling system efficiency by removing rust, scale and other residues. A lubricant conditioner will help prevent rust and corrosion while lubricating the water pump. The solution also contains inhibitors that help prevent radiator deposits that cause clogging and overheating. Used together these solutions will improve overall maintenance of the coolant system and extend radiator life.